Barracuda Studios produces a growing line of resin details under the BarracudaCast brand to compliment their BarracudaCals decal line. 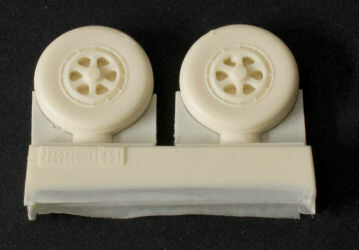 In this release, we have nicely cast set of main landing gear wheels for the Kinetic 1/48 S2F Tracker kit. This set renders the main wheel hubs used on the S2F prior to the brake updates performed in the 1970s. The Kinetic kit provides the post-update main wheel hub patterns, but if you're modeling an older Tracker, here are the main wheels needed to backdate your model. Cast in tan resin, these wheels are ready for installation on your project. 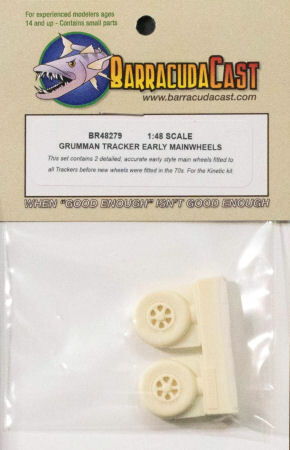 For a look at these parts and other options from Barracuda Studios, stop by their website at barracudacals.com. My sincere thanks to Barracuda Studios for this review sample!